In August of 2016, Logan and I took down the two dying trees that were along our driveway. I saved a few pieces of the wood and attempted to cut them into tiny slabs. There’s an old saying that goes something like “logs rot and lumber dries.” Yes, you can leave a log to sit there and dry completely, but it’s better if you can cut it into very rough sizes and stack it up with room for air to move between all the pieces. It will drive more evenly with less cracking. I finally pulled it out of the shed a couple weeks ago and stared at it … it wasn’t particularly beautiful cherry, but it seemed fun to use it for a small project. I remember Grandpa Martens making crosses out of the tree they took down in his front yard so I set off to make a cross as well. 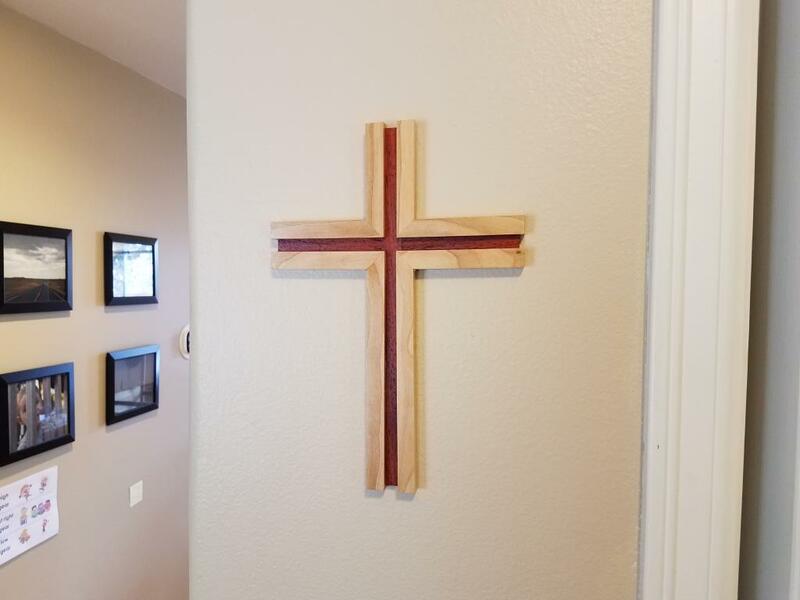 The design emerged from some trial and error, but I ended up building a cross with 45 degree miters to fit all the pieces together. Then I sawed it in half in both directions to end up with 4 L shapes. I cut a rabbet into all of the interior sides and inlaid a piece of paduk, leaving the cherry a bit longer than the paduk. It was a tricky glue up but it held together. I finished it off with a couple coats of shellac. I think it will look a bit better as the cherry oxidizes and darkens over time.